A trip to Hong Kong in 2008 brought me to the wonderful world of DE, or DRAMATIC ENGLISH: the world's most developed program to teach English through drama. 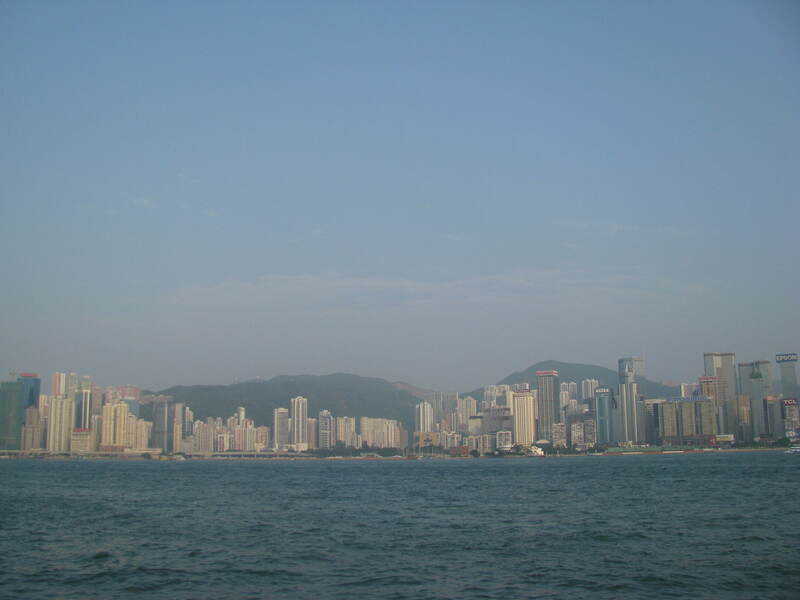 Run by Mr. Man Cheung, this large and comprehensive program serves the Hong Kong community as well as surrounding areas. Its program is huge as are its goals. The following comes from the Dramatic English Website. To send DE's native English teachers to your secondary school to teach junior forms English DRAMA & LANGUAGE ARTS lessons during regular school hours. To send DE's native English teachers to your secondary school to teach NSS English LANGUAGE ARTS electives during regular school hours. 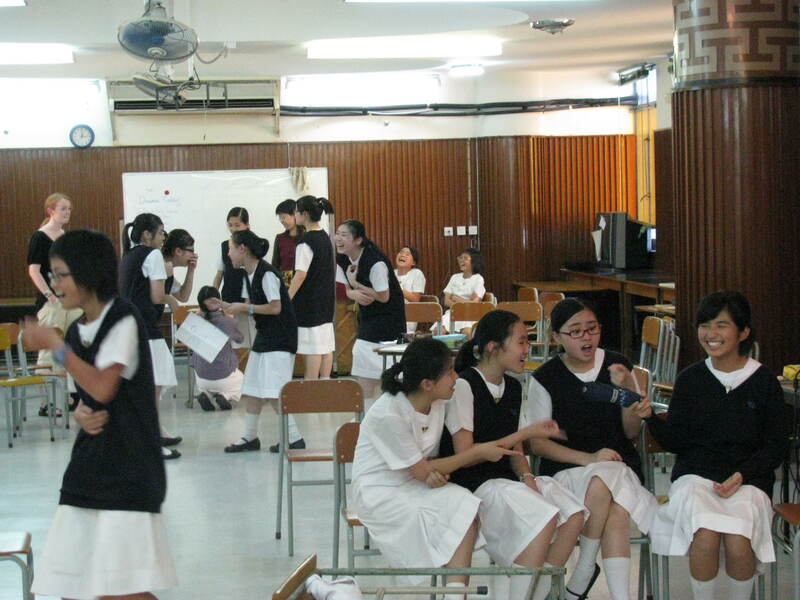 Helping pre-S1 students to adapt to secondary school's English intensive environment. Please click any of the above for more details of each service. DE operates a unique education centre in Jordan, Kowloon, open to the public, offering unique training courses in English musical theatres and English drama; as well as many English and language arts courses for children and teenagers. The DE Studio also offers the unique Dramatic Business English Course (a Continuing Education Fund re-imbursable course) for adults. DE has established this professional TIE ensemble for over 2 years. Hong Kong's professional theatre is dominated by ensembles in Chinese. As an international city, Hong Kong needs to have more professional shows in English. DE's TIE Ensemble devises and performs original plays and musical in English. We have toured our shows to over 100 schools in Hong Kong; we are performing in the Wetland Park which is sponsored by the HSBC; we are also performing in the Heritage Museum which is sponsored by the LCSD of the Government of the HKSAR. DE uses the concept of a large scale improvisation theatre to lead large groups of students to experience/participate in a big show or big game together. A unique, fun and effective approach for students to practice their English, an experience they will remember for a long time. Consolidating the experience of applying drama techniques and training into language learning, DE also publishes textbooks in Drama and the Language Arts for junior secondary and senior primary students. The Dramatic English Language Arts Series comprises practical textbooks for students to step into the wonderful and interesting world of English. The series of books also come with comprehensive Teachers’ Books to guide teachers to deliver the curriculum with ease. I asked Man about how he thought to establish DRAMATIC ENGLISH and he told me it was because he wanted to teach English when he returned from Australia, but found that students were unmotivated, fearful of using English in and outside of the classroom, and in general, more failed than passed English exams. He thought a more friendly, active, and cheerful approach was necessary so began offering free seminars to local teachers to get them interested in using the dramatic approach. First, eight teachers agreed to help him and he piloted the new program in the Hong Kong schools. More teachers joined the program and it grew till there are over thirty-six teachers in more than fifty schools in Hong Kong today. 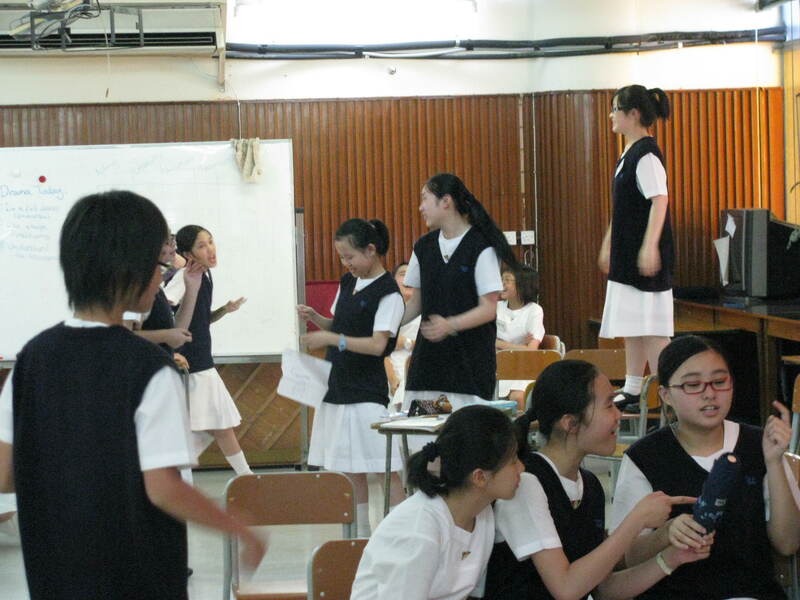 Dramatic English provides teachers for three distinct learning areas in the Hong Kong public schools. The first provides English Drama and Language Arts courses in the junior forms, the second teaches English Language Arts in the secondary schools, and the third, Drama and Language Arts in the primary schools. As part of its program, Dramatic English also offers workshops for secondary and primary teachers. Dramatic English also produces and directs musicals in the schools, guides drama groups to compete in the National Drama Festival, and provides support for extra-curricular activities. I asked to go out to the school sites to observe some Dramatic English instructors in action. Man suggested I take a look at the classes of three instructors who were each doing slightly different kinds of work within the school system. The first teacher I watched in action was Stephanie Fuller. For a look inside the Dramatic English program, click here.